The big picture makes a difference. Why are you doing it? How does it relate? At InSource Solutions, we can help your manufacturing company connect the dots so the people involved know why they are performing a specific test and how it relates to overall customer satisfaction. Furthermore, we’ll relate those KPIs to the day-to-day actions of your personnel to reinforce their crucial role in sustaining and increasing quality. Quality Management Systems. Every organization needs a framework and set of standards for managing processes. 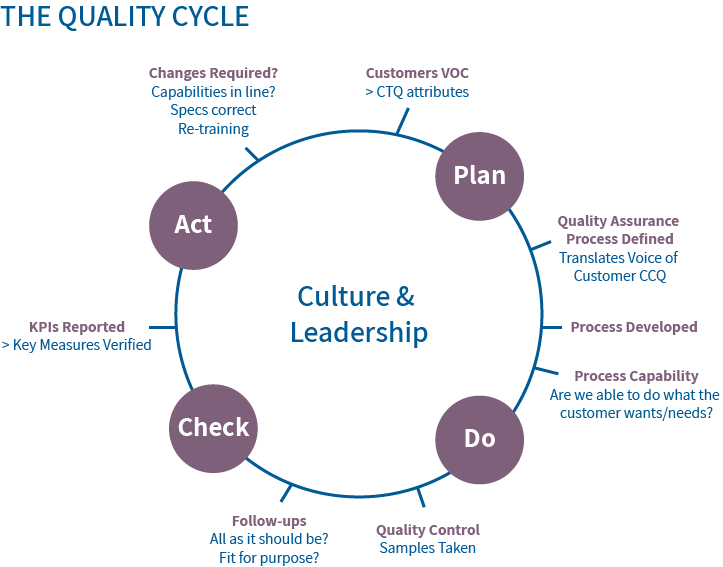 ISO provides international standards for deploying quality processes. Product Quality. Sampling plans and samples, testing plans and tests and the associated recording and reporting systems are some of the core requirements to manage product quality. How these are executed and managed through the various resources determines how effectively you can confirm that you produced what was expected. Process Quality. The more you know about your processes, the better you can enhance them. Knowing and managing the set points of the processes and managing them in as close to real time as possible will help minimize potential exposure. Planning for Quality. This will include Design for Six Sigma (DFSS), Failure Mode & Effects Analysis (FMEA), Design of Experiments (DOE) and Measurement Systems Analysis (MSA). When you plan for quality, you reduce the amount of first pass quality losses, which leads to a reduction in waste and customer complaints. In execution, we’ll incorporate Statistical Process Control. Identifying Defects and Defectives. Even with the best planning, defects and defectives can occur. As you immediately take action to address these issues, having the operators classify the type of issues they are encountering goes a long way toward solving problems. Assignable Cause/Corrective action is an effective way to keep operators involved in the details of what affects quality. Improvements. There are many tools for analyzing and improving product quality when products don’t meet the Voice of the Customer (VOC). We may use in-depth tools such as ANOVA or tools such as Fishbone Diagrams, Scatter Plots, Control Charts and more. The bottom line? Amazing results can take place when companies integrate process and product quality management tools into how people actually work and align expectations to what the customer wants/needs.